There's a particular type of videogame ad that turns up when hardware generations are turning over and manufacturers are jockeying for position. These ads focus on geeky statistics and specifications, trying to prove to potential buyers that one system is superior to all others while the general consensus remains up in the air. Ad messages of this sort tend to fade away after sales figures come in, software libraries mature and it becomes clear where the action really is. It's just too obvious that the points of comparison have been, shall we say, carefully selected. 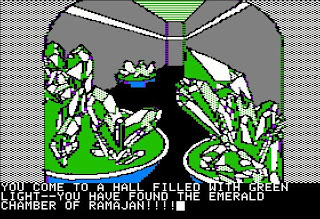 Atari compares the Lynx's 4096 colors to the Game Boy's 2 -- which isn't even accurate, as the Game Boy could muster 4 shades of green/gray -- and ignores the Game Gear's similar 4096-color capabilities. The molded rubber hand grips is just filler, and right or left hand play seems like a minor feature at best, given the ambidextrous requirements of most videogame controllers. Even the ballyhooed 5.0 rating from GamePro magazine is a questionable citation, as GamePro was not regarded as a bastion of journalistic integrity at the time, and the Lynx was relatively new and technically impressive when it was reviewed. It was only as time went on that the technically limited GameBoy's superior software library made it the platform of choice. 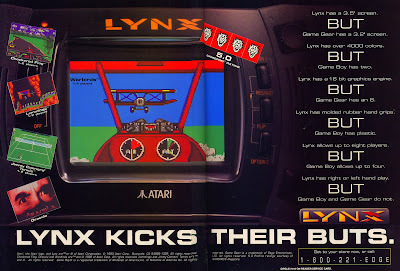 And blowing up the Lynx's relatively low-resolution screen to full-page ad size wasn't a great choice either -- Warbirds was a decent biplane air combat game that looked impressive in motion, with smoothly scaling sprites that neither of its competitors could have managed, but presented as a static screenshot it's hard to see anything impressive about it. In the end, it all came down to the games -- no platform is ultimately judged on hardware alone, there has to be something fun to do with it. Nintendo had Mario and its happy stable of third parties supporting the GameBoy, Sega had a whole mess of Sonic and established Master System and Genesis titles to port over to the Game Gear. Atari's Lynx was an impressive, well-engineered piece of hardware... BUT. I can't quite figure out the source of his visible discomfort. One possibility is that in the original photo, he's sitting on a flat surface with his left leg resting on the floor. That would mean that his right leg is extended into the air, AND his head is tilted to his right at a pretty extreme angle. Or perhaps he's got both legs on the floor, with his back and head crammed up against some kind of support. It's remotely plausible that he actually struck this pose in midair, with a very fast camera shutter speed, but the pose is not so much dynamic as anatomically awkward -- human bodies aren't quite supposed to fit together this way. And I'm sure the "KA-POW! OOMFPH! ARRGH!" sound effects are meant to represent his unseen criminal foes falling away beneath the force of his mighty punch-kickiness. But it could also represent the sound of his vertebrae exploding and his subsequent cries of pain and shock. 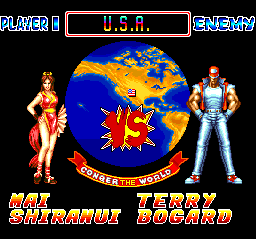 I don't know who this guy was or where he is now, but I'd be willing to bet he curses Taito's art director every time he visits the chiropractor. 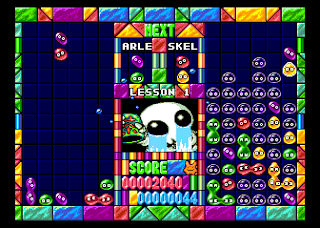 Puyo Puyo (pronounced "pyohh pyohh") is a venerable puzzle game series in Japan, spawning many titles on many platforms ranging from the MSX 2 home computer to the Wii; the games occasionally turn up under the Puyo Pop moniker in the West. 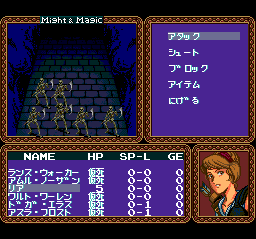 The colorful characters are drawn from another Compile game series, the dungeon-crawling RPG Madou Monogatari, which explains why our heroine wears armor and her opponents are strange creatures like mummies, demons and fish with arms. 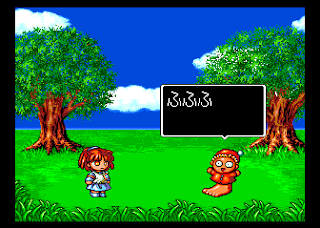 As far as the game itself goes, it's a very polished presentation of Puyo Puyo. 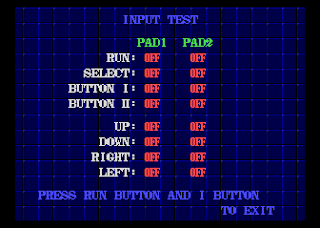 There's a single player-vs.-CPU story mode, a two-player pick-your-character contest, and an infinite mode where the pieces just keep falling until the player is overwhelmed. The gameplay is generally the same in every mode, with difficulty ramping up as appropriate -- the goal is to join four colorful little jellies together, with extra points (and opponent penalties) racked up for chain reactions. 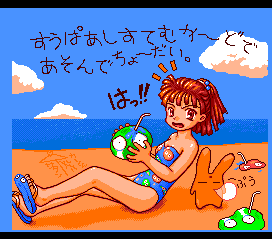 Puyo Puyo CD is great fun and would have translated well to the US market -- it's another missed opportunity for NEC, who seemed determined to bury the TurboGrafx-16 under a stack of generic action games. I'm another one of those diehard TG-16 gamers who eventually had to become PC Engine gamers to get access to the platform's best software. This one has a permanent place on my to-play shelf. 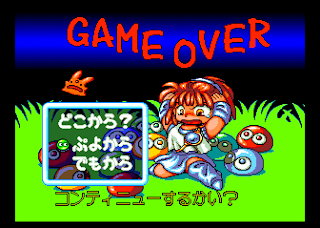 If you're interested in a little Puyo Puyo fun,the easiest game to track down is Sega's retrofitted conversion Dr. Robotnik's Mean Bean Machine for the 16-bit Genesis. 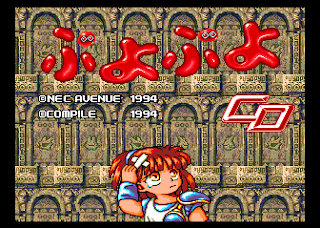 But if your collection cries out for Eastern flavor, Puyo Puyo CD will run on the American TurboDuo or the Magic Engine emulator, and you may be able to find it at this affiliate link. As the game industry grew and became more mainstream in the early 1990's, licensed sports games became de rigeur, replacing the generic sporting titles of yore with Buster Douglas Boxing, Brett Hull Hockey and so forth. 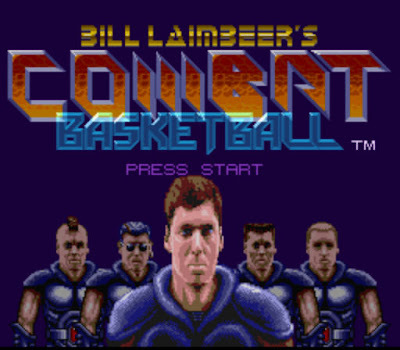 The threadbare backstory was rewritten to suggest that a cybernetically-enhanced future Bill Laimbeer took over the NBA and threw out the rulebook and referees, making basketball in 2030 a very different game. 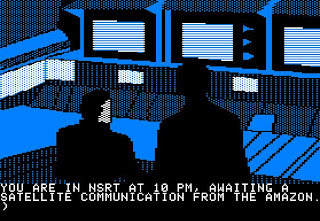 The gameplay is unchanged from the original, and consists of slowly moving one's awkward cyberpunk players around the field, trying to land a blow and take the ball from the other team in the hopes of getting it into the basket at some future date. 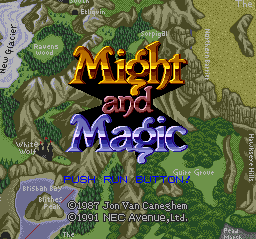 The game has that early-90's European Amiga game feel about it -- impressive music, some neat graphic effects and fine details, but the sprites are small, and it's generally a slower game than most console titles of the time. 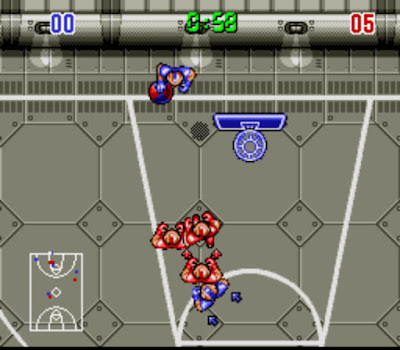 The game was likely rushed onto the SNES to make the system's launch period -- there's a bit of Mode 7 animation on the title screen, spinning and zooming a basketball into Laimbeer's digitized hands, but the in-game ball uses a pixel-lattice shadow brought over directly from the Amiga, ignoring the transparency capabilities of the SNES. The gameplay is fun for a little while, but it's no Speedball. It was one of the first sports-like games released on the SNES in the system's early days, but I can't imagine too many players were eager to cough up the $59.99 retail price. Still, the license may have been a good investment for the long term -- if it weren't for Bill Laimbeer's name on the package, this title might be as forgotten today as the original Future Basketball. The Gaming After 40 video podcast is also available on iTunes -- if you're a subscriber there or via Podcast Alley, please vote! Your feedback and opinions are valuable. 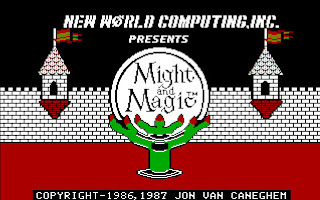 To all those who passionately believe that Kevin Flynn, digital pioneer and legendary game designer, is still alive... LISTEN UP! Our last event at Flynn’s Arcade was a call-to-arms for those of us who won't buy into Encom-driven public propaganda about what happened. We're not crazy - there's more to this story than they are letting out. Today, we have the chance to find out more... to get closer to the truth. WE NEED YOUR HELP! I escaped from Pulsar 7 using ScottFree the first time through, again for the sake of faster save/load support; I was not actually able to figure out the SAVE GAME system on the Model I, getting a Disk I/O error every time I tried although I swapped diskettes around a bit and checked the writeable status of the disk (and the disk image.) Fortunately, the random deaths are relatively rare in this game and it was not a problem to play all the way through safely once I knew what I was doing. The game's map is a little bit confusing; there are some one-way passages that don't quite make sense in what seems to be a naturalistic sci-fi environment. I also had to consult a walkthrough to get past a couple of roadblocks, but all in all I enjoyed this game quite a bit. One of my goals with this series is to document a variety of adventures in some detail, so curious readers can learn more about these games without necessarily having to play them. But if you plan to play Escape from Pulsar 7 yourself, I advise you to stop reading for the moment -- I'm going to give away some things that are more fun to discover on your own. The game's dictionary makes an interesting and sometimes frustrating distinction between LOOK, SEARCH and EXAMINE, which are usually treated as synonyms in other adventure games. Right at the outset, LOOK COUCH does not return anything interesting, but EXAMINE COUCH does. And MOVE COUCH also comes in handy. 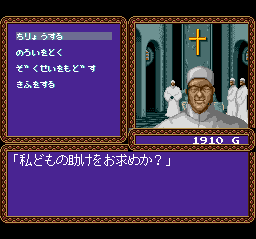 Given the 16K memory constraints under which this game was designed to run, there isn't much room for plot exposition. About the only clue we get beyond the title is a fragmentary note that reads, "... as the only surviving member of the PULSAR 7 crew....". In my first attempt, I quickly learned that we are not actually alone, as finding myself in a nice warm bunk, I opted to SLEEP, and the game informed me that I fall Asleep!! CREATURE rips my head off! I'm dead -- and the location shifted to I'm in the MANURE this time !! There are some tricky and semi-random puzzles in this game, but they make a little more sense than the ones in Howarth's fantasy adventures. For instance, when we close the door of the crewman's cabin, a pillow appears on the bunk. But it's labeled as an Auto-dispense pillow -- so we know it's not, y'know, magic or anything. It is strange, however, that if we LOOK PILLOW we learn nothing; it's impossible to TAKE PILLOW; but if we MOVE PILLOW we find a circuit board that wasn't there a moment ago. After getting choked by dust in an air vent the first time I went in, I was glad to find the hazard is simply random on my next attempt. But my attempt to settle the dust by pouring water in the area was unsuccessful -- it just created a puddle alongside the dust. The room should just be avoided whenever possible; it's encountered early in the game, and need only be passed through once. The game has several places we can GO which aren't immediately obvious, like the control console and the lathe. Oddly, the ScottFree interpreter allows one to pick up the larder in the galley and carry it elsewhere -- wherever it's dropped, if one GOes LARDER and comes back out, one finds oneself in the galley. But the original game does not have this bug, so it's clearly not meant to be a space-warping puzzle solution. I spent quite a bit of time in the Pulsar 7's airlock trying to figure out how to keep myself from getting blasted into space. Even when I was wearing the space suit and magnetic boots, the result was always the same. A much-appreciated walkthrough informed me that there's a secondary, well-hidden emergency airlock. The map's use of doors is very strange -- sometimes we OPEN DOOR in one place, GO DOOR, and don't end up in the room where the other side of the door is actually located. In one spot, we have to both OPEN DOOR -and- GO DOOR for it to be set to an open state, otherwise we appear to go through it but it remains closed. We are equipped with a wristwatch at the start -- we can't READ or LOOK WATCH, but have to EXAMINE WATCH; all it reveals is the current move count, so it's best to drop it and save the inventory slot. The ship's artificial daylight ends after 100 moves, and everything goes dark if we haven't found a light source by that point. The darkness proves fatal eventually, as the CREATURE attacks. The lathe's description indicates it needs to be repaired; not so for the oven, but it has a round hole that we can fill with a square block we've turned on the lathe (TURN SQUARE). But we can't PUT ROUND or INSERT ROUND -- we have to FIX OVEN. That tripped me up for a bit. It wasn't clear to me that the locker in the storeroom was not open -- neither LOOK nor SEARCH nor EXAMINE gave me any impression other than that the locker was open and empty. In fact, OPEN LOCKER yields I don't understand your command. I had to reference a walkthrough to learn that SMASH LOCKER (once the hammer has been found) is the way to access its contents. The available light source grows dim and eventually goes out, so time -- efficient movement, actually -- is of the essence. There are two points where we have to EXAMINE CEILING from a bunk to find somewhere new to go -- I missed this entirely and needed a walkthrough nudge, as the first ceiling entrance I found was clearly visible. Even once we have seen it, TAKE GRILLE and MOVE GRILLE do not work, but REMOVE GRILLE does - Grill comes away with a strong pull! (and disappears entirely.) This reveals a hole -- but we can't GO HOLE or SEARCH HOLE to find anything of interest. We have to JUMP HOLE. In the first hidden area, we find a length of cable, and a specimen cage nearby. There's no reason to go into the cage other than to make use of the key found earlier -- the cage door slams behind us, and it's shown as a Locked door. But UNLOCK DOOR doesn't do anything, we have to OPEN DOOR with the key in hand to get back out. And if we go back in afterwards, the door now shows up as an Open door even though Door slams behind me! every time we go in. It's wise to avoid the specimen cage altogether. A shipping crate in the same area contains a square block - we have to GET SQUARE, not GET BLOCK. Fortunately in this case, the parser helpfully suggests: Use a shape i.e. "GET SQUARE", so it isn't a gameplay issue. We can't eat the raisins or the flour found in the larder, presumably because we need them for something else, though I kept trying to MAKE BREAD until I found a cake tin later on. I examined the Captain's bunk, while in the bunk, and found some white tablets. EAT TABLET puts us to sleep, and the CREATURE rips our head off again -- but the fatal outcome does provide a clue. We have to use the tablets, along with water, raisins and flour, to MIX CAKE and BAKE CAKE - we end up with a drugged fruitcake. But if we don't have the tablets when we mix the cake, there's no way to add them to the mix before baking it, so timing is critical. Fortunately the CREATURE's physiology is similar to that of human beings, however unlikely that may seem. We're near the end of the game when we can GIVE CAKE and learn to our satisfaction that The CREATURE ate the lot! Then fell asleep! 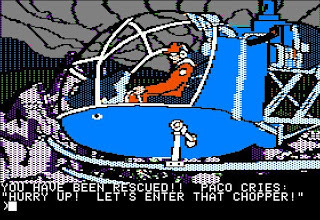 Escape from Pulsar 7 was an entertaining challenge -- not too arbitrary, and tough for (mostly) the right reasons. Maybe I'm just personally biased toward the science fiction side of things, but I had a lot more fun on the Pulsar 7 than in Howarth's fantasy worlds. I look forward to Mr. Howarth's next tale of intrigue and inventory. WiiWare -- 3 new games today. GhostSlayer is a Motion-Plus-compatible swordfighting game; it's an arcade-style game ("on rails") and likely repetitive, but may also be physically a lot of fun in small doses. Mouse House is a cute logic/machinery puzzle game. And Family Go-Kart Racing is yet another in the competent but uninspired Family series, a kart racing clone with no online play. Wii Virtual Console -- Nothing this week, unfortunately. DSiWare -- 4 titles this week, 3 of them games. Aura-Aura Climber is an arcade climbing contest about a wannabe star (of the celestial variety). Flight Control is a fairly full-featured casual air traffic control/landing sim. Faceez is a creative photo/dress-up/animation tool meant for silly portrait-shopping. Flipper is a platforming game about a boy searching for his lost goldfish. 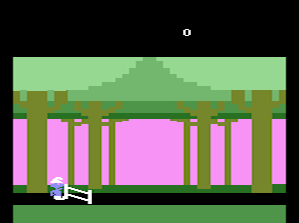 XBox Live Arcade -- One game last week, The Misadventures of P.B. Winterbottom, an innovative and stylish platformer with a fantastic ragtime score, a silent-movie-style presentation, and a neat capture-and-replay character cloning concept at its heart. I played through the demo levels of the trial version, and will consider unlocking this one when I'm in the mood for a puzzler. PS3 on PSN -- Another gameless week on the PS3 downloadable scene, but things look to be picking up again soon. There are two items worth noting here. 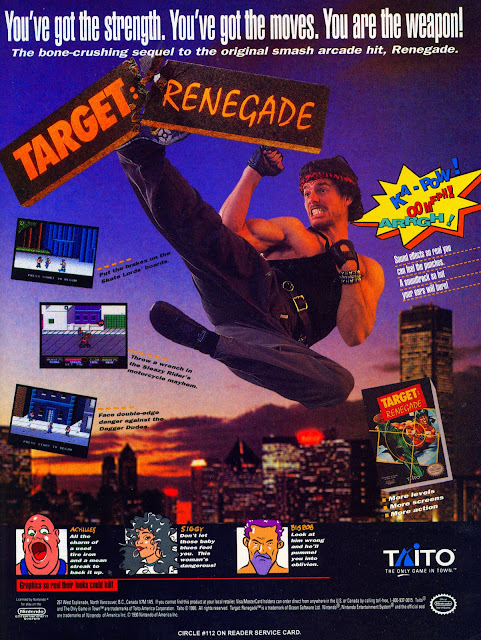 One, Tiny Toon Adventures is featured as one of the launch games; it was never released, establishing an unfortunate trend in Jaguar advertising right at the outset. Only Cybermorph (the pack-in) and Trevor McFur in the Crescent Galaxy were listed as available now, but Raiden and Checkered Flag were in fact coming soon and did make it to the shelves in short order. Two, the leaping Jaguar image is portrayed as chewing up the competition, as represented by a couple of popular, trademarked and generally well-protected videogame characters owned by other companies. And while the characters' ownership is duly noted in the legal fine print, one doubts any official permission was sought from or granted by Sega and Nintendo. In fact, it appears that Atari simply lifted the artwork from other sources -- Sonic the Hedgehog looks like he did in the Archie-label comic books, and Mario is wearing a chef's hat a la Yoshi's Cookie. 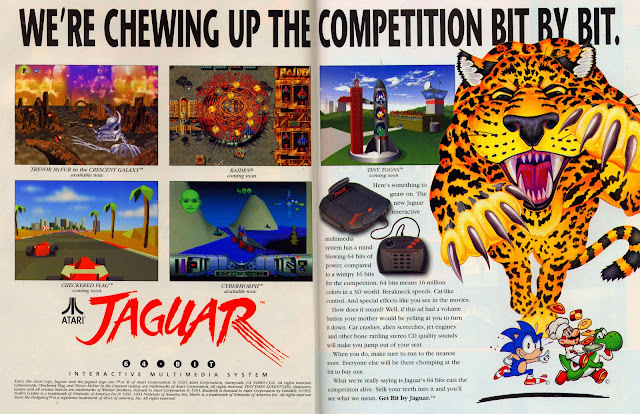 Get Bit by Jaguar, the ad says, but the leaping jungle cat was rarely seen in Atari's post-launch ads, despite the ad copy's promise that the Jaguar would eat the competition alive. Mario and Sonic were a lot tougher than they looked. Question one -- what exactly does this have to do with video games? 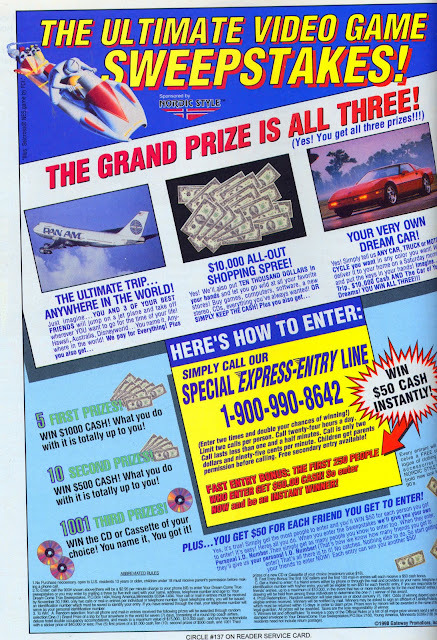 The grand prize involves a trip anywhere in the world, where I suppose one could play some video games; a ten thousand dollar shopping spree, which one could possibly spend primarily on video games; and a dream car, which might be used to, um, drive to the store and buy a video game. There are a number of first, second and third prizes, several of which involve cash, most of which involve the CD or cassette of your choice. But there's no video game playing featured in the ad, or indeed involved in the sweepstakes. The whole thing appears to be totally generic, and is sponsored by Nordic Style, a company that sells snowmobile wear. Even more interesting, the sweepstakes ad indicates that "YOU GET $50 FOR EACH FRIEND YOU GET TO ENTER!" Which brings us to question two -- how exactly is this promotion being funded? Ah, now this is making more sense. Calling the Special Express-Entry Line costs the caller $2.95 per minute. The call length is purportedly "less than one and a half minutes", which likely means it gets charged as a two-minute call for $5.90 by the phone company's decimal-impaired billing systems. Simply get the most people to enter and you'll WIN $50 for each person you got to enter! So there's ONE person who will get to win $50 for each person they got to enter. Of course the fine print further limits this to a maximum of $10,000, in the event someone somehow convinces more than 200 people to enter. There's also a Fast Entry Bonus guaranteeing $50 to the first 250 people who enter; per the fine print, the first 150 callers and the first 100 mail-in entries qualify. And of course the fine print qualifies most of the prizes to some degree -- the Ultimate Trip is for 7 days, with coach airfare and "deluxe hotel double occupancy accommodations," and the dream car is limited to a sticker price of $40,000 or less. It was apparently not illegal to run this kind of a sweepstakes, but it still seems like a scam to me -- there's not a direct charge to enter, but use of the phone line to jump quickly onto the bandwagon is clearly encouraged. So I hope these people got exactly 250 entries, including 150 by phone and 100 by mail, all inspired by the same person. That would mean they would have collected about $900, and given away about $90,000 in prizes. But I doubt that's what happened. Younger videogame fans may not be aware that Japanese role-playing games were originally inspired by Western RPGs, which were in turn based on pencil-and-paper RPG systems like Dungeons & Dragons. 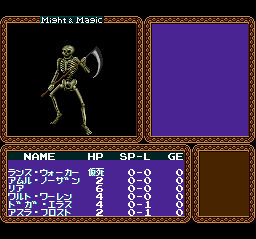 In the late 1980's and early 90's many American RPGs were translated and released for a Japanese audience hungry for further monster-slaying adventures. These were not just localizations, but completely new development projects running on different hardware, and as some time had usually passed between the original's release and the Japanese conversion, the games were often significantly upgraded in the process. 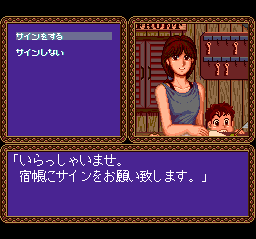 The game opens with some spoken narration in Japanese, but the bulk of the intro is presented by animated pantomime cut-scenes with epic, CD-based music. 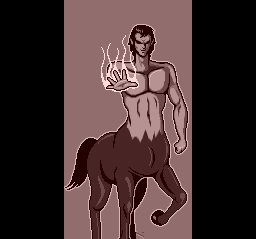 Our hero arrives on a ship (a familiar starting scenario for Japanese RPGs - see Falcom's Ys), only to have his vessel and crew immediately decimated by a fireball-throwing centaur. 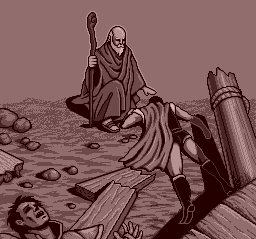 An old man with magical powers whisks our hero away from the scene of the carnage, and the adventure begins. 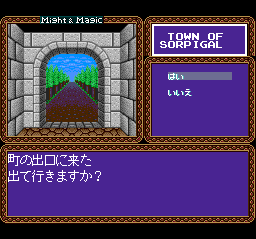 Normally my lack of Japanese-language skills keeps me from getting anywhere in an imported RPG, but I found Might and Magic more welcoming than the norm for a couple of reasons. 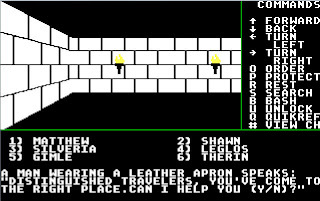 One, old-school dungeon crawlers tend to have similar designs... presented with an archway to the wilderness, there's a very good chance that the top option means "leave town," and the bottom one means "stay here for now." 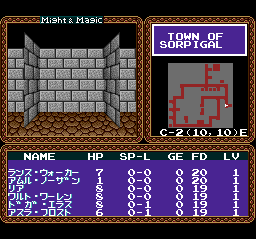 And even though the text is mostly in Japanese, location names are in English, both within the game and on the map included in the double-wide CD case. This may be a good or bad thing, depending on one's point of view, but the Japanese version is also quite a bit easier than its Western counterpart. 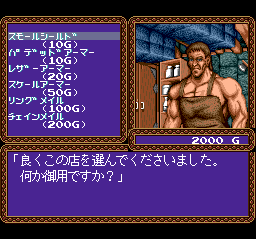 While the original game starts the party off penniless, the PC Engine version stakes the player to 2000 gold pieces to faciliate equipping the party and keeping it alive during the tough early going. On the PC, I rarely came across enough money to heal the team properly, so we had to make frequent returns to the inn to preserve our hard-fought experience gains. But I enjoyed the game enough to spend quite a bit of time with it on both platforms -- it's a classic dungeon-crawl with a simple story, but it has enough depth to keep it interesting. Someday I hope to pick up Might and Magic III - Isles of Terra, the 1993 sequel which made it to the US as a late release for the Turbo Duo. But it's now a collectible on the rare, pricey end of the spectrum, so this version will have to satisfy my M&M cravings for the moment. I've been thinking about this quite a bit lately, and I'm going to lay out a rough experimental design for an evolutionary approach to AI. For the moment I'm calling it ELI, for Evolving Language Interpreter, in homage to the classic AI simulation Eliza. I've considered whether using the Z-machine is a cheat, but there are biological analogies here. It's very possible that chimpanzees have the vocal hardware necessary for speech, and we know apes can deal with language to a degree. But our close relatives don't seem to have the cultural urge to communicate in the way that we do. Similarly, the Z-machine is platform-independent and abstracts out the details of input, output, parsing and response so we don't have to deal with those at a code level -- that is, the hardware is already in place -- but it doesn't impose too much of a framework on what our random code does with its available mechanisms. It does have an internal data structure, but so does our brain, and we are not generating anything but random code -- if it fits into the structure and does something interesting, then we are making progress. The gap between 2 and 3 is likely to be very wide, and I have no idea what to do with 4-9 yet. But at this stage everything about this idea is up for grabs, so I'll go with this for the moment. There are also some technical considerations. Early implementations of the Z-machine could handle up to 128k of code/data, so I'm going to start with a small codome size. This will allow room for the system to grow and develop before its brain gets too big for its skull, so to speak. Later implementations such as Frotz allow for larger files, so this may not prove to be a real constraint -- at any rate, if an individual codome grows too large for the Z-machine to run, its fitness will revert to an evaluation status of 0, essentially killing off that individual and limiting ELI's development in a completely natural way. I'd ultimately like to build a website so many more people can try and evaluate ELI's current state, but to begin with I'm going to take a very simple approach to see if the idea even gets anywhere. I'll write some code to generate a number of random codomes, and attempt to launch each one using the Z-machine. It's very likely that none of them will even run at first, so everybody's fitness will be the same (i.e. 0) for the second generation. Essentially all we'll have is random combination and mutation for some number of generations, all descended from the first random round of codomes. If this approach is able to generate something that will at least launch under the Z-machine, that individual will gain fitness level 1, and its codome will inform multiple descendants in the next generation. I expect that mutation, if it does arise, to spread very quickly. It is also possible that mutations will arise in such a way that we jump from 0 to 2, receiving a sensible opening salutation like Hi. or Greetings! from the codome as soon as it's able to execute. But as there's no selection pressure on the content of the opening statement until the codome can at least run, this is not likely. It's a simple first step to try, at least, as the Z-machine testing can be automated -- I don't have to sit down and evaluate every response manually to start with, just let the process work until it comes up with (or runs for a long while and fails to come up with) a viable bit of Z-machine code. Whatever happens, I'll share the results here. This one's just for fun. I went looking for this adventure game based on a vague memory of its existence, half-certain my aging memory banks had conflated Oo-Topos creator Michael Berlyn with a popular fiction author. 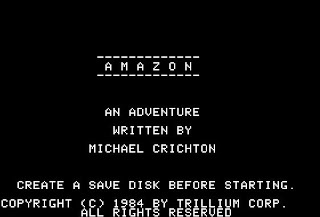 But no, it's true -- back in 1984, Trillium/Telarium Software published Amazon, an epic adventure game written by speculative fiction novelist Michael Crichton, creator of Westworld and Jurassic Park, among many others. Crichton's approach to interactive fiction has some unique qualities -- it's interesting to see what an established novelist inexperienced in an interactive medium comes up with, and the plot has a tight sense of pacing. 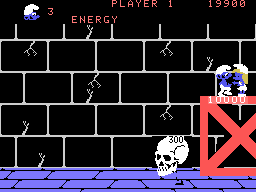 But the gameplay is consequently limited by the author's ideas about what must happen next -- some elements are just there for the sake of interactivity (like asking the player's name and using it at every opportunity), and there are many moments where the player is constrained to a small set of commands, or even one. Still, it's clear that the author thought about the story's structure and wanted players to experience the whole adventure -- many puzzles have alternate solutions or can be ignored/avoided altogether, and the game does a lot to nudge the player along. To his credit, Crichton also shifts freely between formats -- it's surprising how innovative it seems when the graphics go away for the sake of denser text, or when an animated display takes over for a videogame-style segment. Fans of the genre (or of Michael Crichton's work) are encouraged to play Amazon for themselves before reading further. As usual, I will shortly be giving some significant plot points away for the sake of historical documentation. After the dramatic satellite transmission sequence, our boss Murphy wants to see us in his office. Crichton's "steering" approach to interactive storytelling becomes clear here -- if we try to LOOK or otherwise get our bearings, we are told YOU BETTER GO TO THE OFFICE, and only GO OFFICE is accepted as a productive response. Interactivity remains very limited as we "converse" with the boss. He asks our name, which the game uses mechanically in several places later on, and asks us some questions, generally ignoring our answers; MURPHY NODS UNDERSTANDINGLY whether we say YES or NO. It's nice to see some fresh, literate verbiage that breaks away from the Scott Adams/Crowther & Woods standards; for example, Crichton's game tells us YOU HAVEN'T ANY POSSESSIONS when INVENTORY is empty. 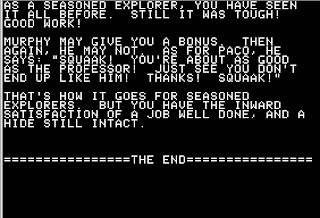 The game also offers three difficulty levels -- I opted to play as a medium-level Seasoned Explorer. Research indicates that some new puzzles appear, and others are harder to solve as the difficulty increases, but there's not a big difference between the options. Still, it's a nice idea that delivers some replay value. There really isn't much to do in the early part of the game -- we just GO places as directed, like the OFFICE, the AIRPORT, and MIAMI. We can't even go to the wrong place. It's a shame because there's a nice sense of realism otherwise - we have to tune in the satellite transmission, and review the posted airport schedule. We just can't do anything with the information that Michael Crichton doesn't want us to. 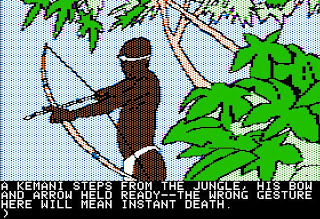 Despite the author's guiding fist, there are many fatal scenarios -- upon arriving in Miami, if we don't insist on going to the Archaeological Institute as suggested, the taxi driver beats and robs us, sending us back to Washington in disgrace and ending the game. We arrive to find police cars and an ambulance at the Institute, another nod to Hollywood that works very well. But the varied settings do start to seem dry after a while -- there's very little LOOK or EXAMINE feedback to bring them to life. I also ran into some parser issues -- GO INSTITUTE, as it turns out, does not mean the same thing as ENTER INSTITUTE, causing me to get unnecessarily stuck for a while as the game seemingly refused to let me do anything at all. The name bit becomes gimmicky very quickly -- various people keep asking the player's name, which doesn't do as much for interactive realism as the author hopes it will. 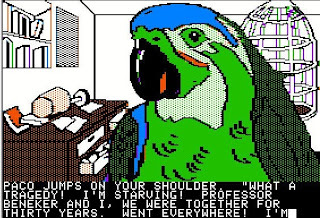 Especially when Paco the extremely talkative parrot asks. In Dr. Beneker's office, we can't OPEN REFRIGERATOR until after releasing Paco and talking to him. The game is quite blatant about it, too -- there's no reason given for the parser's stubbornness, other than that we have to wait and do it later. Getting out of the office is another parser sticking point -- we GO DOOR to enter the room, but GO DOOR after we're there just yields NOTHING OBSERVABLE HAPPENS. We have to LEAVE ROOM. Paco provides quite a bit of help -- his first assist is useful in haggling with the Institute's mercenary director. Paco also jokes lamely -- refusing to fly with the luggage, he says "THAT'S FOR THE BIRDS!" It's a bit confusing that some items have multiple, but single, uses. When I played, I had to bribe an immigration officer in Guatemala with cigarettes. But later, when I encountered the Kemani tribe, they gestured with two fingers to their lips as Paco yelled, "KEMANI PEOPLE WANT SMOKE!!" Unsatisfied, they dumped me unceremoniously in the jungle and let me go on my way. Thinking I needed something the tribespeople might have given me, I went back to a previous save and tried to bribe the officer with other things, like gold and money, to no avail. As it turned out, I didn't need the Kemani people's assistance after all. 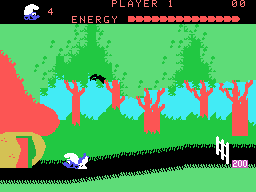 There are some nice spot sound effects in the game, especially by Apple II standards -- effective static, and some excellent bird sounds. As we arrive in the Amazon, there's a nice narrative jump to the post-parachute landing -- we remember nothing at first, but memories flood back after we sit up. Of course, we are forced to acknowledge the repeated PERHAPS YOU SHOULD SIT UP prompts by finally typing SIT UP before anything else of interest can happen. I liked this -- if we don't listen to Paco's direction, we get lost in the jungle. But if we DO listen to him, we also get lost. The unreliable guide is a novel and funny idea. The jungle map is constrained in various fatal ways. Trying to go DOWN from the impassable cliff yields SPLAT!!!! YOU NEVER SHOULD HAVE TRIED THAT. We encounter a wild boar and a jaguar in the woods -- they back off, but if we go in the same direction they did we are attacked and killed. Michael Crichton always likes to use sci-fi technology in his books, grounded in reality to at least some degree. There's an advanced portable laser in this game, but I was disappointed that I never found a use for it other than in a brief arcade-style sequence. There are several cases where we have to rely on a portable computer to navigate to a safe haven -- it's like mapping a maze, but I never did make sense of the coordinate system. At least we can completely avoid danger while we're "in the computer" -- we just have to keep moving N/S/E/W until we reach the target location. It's a novel idea at first when the computer tells us we're at "AU, F1" and there's a safe campsite at "WP, T1", but it gets old by the third round. AND when the system suddenly switches to a graphical view for an action segment where we have to track down a monkey who stole our backpack, it leaves us wondering why this handy-dandy grid display didn't pop up earlier! It would have saved us considerable mapping and frustration. 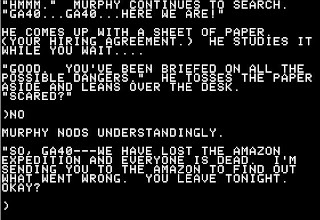 The third act of the game becomes fairly challenging and/or frustrating, with lots of ways to die (but thankfully few dead ends requiring backtracking to address earlier mistakes.) The inflatable raft leaks; we can't turn on the computer; a hippo charges if we don't wait for him to leave peacefully; the river is full of piranhas and alligators; the rifle we find has a bend in it that causes it to explode in our faces if we actually try to fire it. Finally, we find a native boat, but it has a hole in it. We can FIX BOAT - and are prompted WHAT WILL YOU USE? I spent considerable time trying to USE RAFT - the game lets us make a patch, but then informs us we have no way to hold the rubber in place. I wandered around trying to locate some sort of adhesive, before finding out that USE PARACHUTE works with no fuss. Another parser oddity -- TRANQUILIZE is taken to mean the same as SHOOT, with the weapon (dart gun or rifle) selected automatically depending on the intended target. We tranquilize Paco, but attempt to shoot other animals with the rifle. Crichton's design treats the USE verb in an unusual way -- most games take it to mean the most obvious thing to do, as in USE SHOVEL meaning DIG. But in Amazon, USE means something more general -- we USE RIFLE like a bludgeon to beat the alligators away, for example, and USE GUN to convince a frightened Paco to cross a bridge. In neither case is the weapon fired, which made both of these puzzles difficult to solve until I broke down and consulted a walkthrough. Another scenario that can't be avoided, even though a priori knowledge tells us we should try, occurs after reaching the final campsite. We're supposed to call Washington before we fall asleep -- while we sleep, monkeys steal our backpack, and the home office yells at us in the morning for not calling in sooner. But it's actually impossible to follow our orders -- the plot dictates that sleep must happen, and so it does. In the morning, the plot keeps charging along as our computer starts beeping; if we try to take INVENTORY before answering its incessant call, we are told NO TIME FOR AN INVENTORY NOW. YOUR COMPUTER IS BEEPING. And if we try to explore or go searching for our belongings without calling in, we learn YOU BETTER FIND OUT WHAT TO DO BEFORE YOU GO ANYWHERE... Sigh. At least Crichton's constraints have a sense of humor -- after we recover the backpack, we are told THE MONKEYS ARE PELTING YOU WITH SOMETHING SMELLIER THAN STONES-- it's only spoiled by the following directive BETTER GO EAST. I was disappointed to be nudged out of an interestingly worded jungle maze -- various rooms are labeled TEDIOUSLY DENSE JUNGLE, FEARFULLY DENSE JUNGLE, and so forth, but if we try to actually map it out the game eventually tells us YOU SHOULD HAVE READ YOUR INSTRUCTIONS! Which turns out to mean we are hopelessly lost and must RESTORE, as there is actually no way out of the jungle or anything interesting to find there. ... MUST OPEN THREE DOORS AT ONCE. I SCRATCHED NUMBERS OVER THE DOORS. THERE IS POISON GAS IN THE ANTECHAMBERS, SO OPEN THE DOORS QUICKLY, USING FAST COMMANDS SUCH AS: "OPEN 123"
At first I thought it was a matter of trial and error deciding which doors to open, but then I realized there are visual sequence clues posted above the doors. Oddly, both sets of doors used the same sequence -- OPEN 132; maybe this varies with the difficulty level. I enjoyed playing through Amazon, despite Michael Crichton's insistent authorial voice piping up a little too often for my tastes. If nothing else, the game clearly establishes that the skills required to create compelling interactive fiction are quite different than those for movies and books. And it's a difficult balance -- the player needs to have the freedom to make mistakes, experiment and figure things out, while at the same time feeling like he or she is participating in is a larger story arc. Amazon is at one extreme; mindless treasure hunts are at the other. Somewhere in the middle lies greatness. WiiWare -- Three new games this week. Phoenix Wright Ace Attorney: JUSTICE FOR ALL continues porting the popular DS line to WiiWare, with the second game in the series. Art of Balance is a physics-based puzzler, sort of like Jenga I imagine, with local co-op play. WarMen Tactics is a T-rated military third-person shooter in an urban warfare setting. Wii Virtual Console -- Sega brings Sonic & Knuckles to the Virtual Console, complete with the original game's "Lock-On Technology" that allows playing as Knuckles in the VC versions of Sonic the Hedgehog 2 and 3. Nice to see that feature preserved. DSiWare -- Strong support for Nintendo's portable platform continues with 5 new games this week. Nintendo's own release Spotto! stars a duck on a comical mission to bomb ghosts and save the kidnapped Chikkie, daughter of President (wait for it) Wowwow. 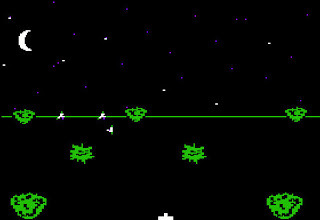 Spaceball: Revolution is a pattern-matching puzzle game. Scrabble Classic is Scrabble on the DSi. Real Soccer 2010 is a sequel to last year's edition, completing the series' distribution strategy transition to the downloadable format. Prehistorik Man is a venerable 22-level side-scrolling platformer, previously seen on the SNES and GameBoy Advance. XBox Live Arcade -- Darwinia+ debuted; it has a nice retro feel, with echoes of Bullfrog classics like Populous and Syndicate, but the controls are a bit wonky when selecting and ordering units around. I suspect it plays much better on the PC with a mouse than with the 360 gamepad. PS3 on PSN -- Nothing new last week, after a fairly steady stream of releases in the early part of the year. 19... oops, 15 Ways to Start the 90s with a Bang! Atari's Tengen division started out as a Nintendo licensee, then broke away from the official program to release games on its own, citing restraint of trade by Nintendo. There was some serious corporate subterfuge involved, as Atari's lawyers obtained the NES lockout code under false pretenses, but Tengen managed to put out quite a few NES versions of Atari and Sega coin-op properties while the various suits and countersuits churned through the legal system. What I've never understood is why Tengen was able to pay Sega to license conversion rights for Shinobi, Alien Syndrome, and Fantasy Zone, while resorting to deception to avoid paying Nintendo. Nintendo's licensing program was famously restrictive -- but it also provided distribution and promotion support, and prevented flooding of the market with mediocre product (at least for a time). Without those restrictions, third parties would have had a tough time making the scads of money most of them made in the NES era. 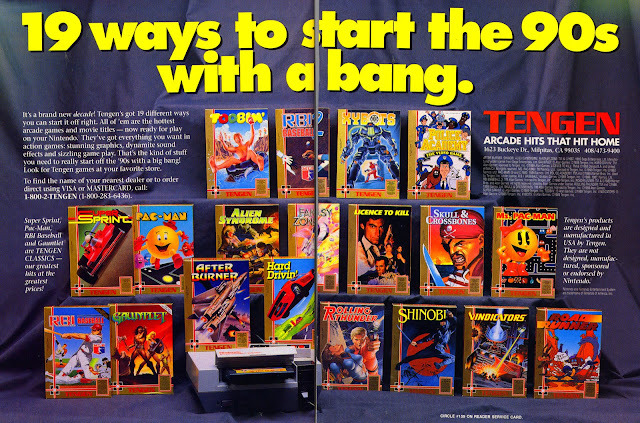 It's true that being out from under Nintendo's thumb avoided the five-titles-per-year restriction and allowed Tengen to produce quite a few games, most of which were better than the other unlicensed NES cartridges on the market. But it really looks like a bad business decision in retrospect. Although maybe not as bad as spending ad money to promote four games you're never going to release. DynoWarz Will Warp Your World! Long before its recent merger with Namco, Bandai was a videogame publisher in its own right. 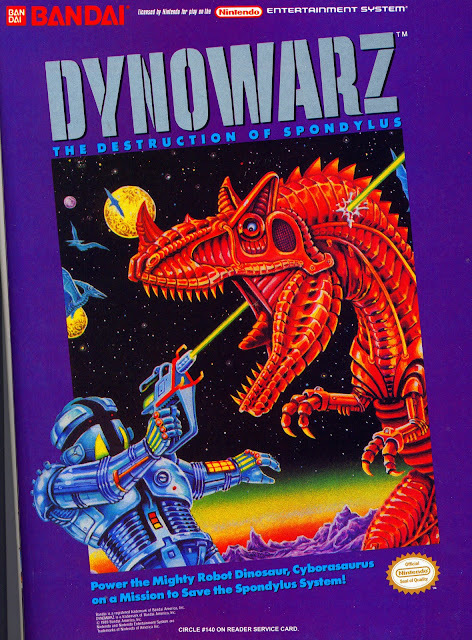 In 1990, it released DYNOWARZ: The Destruction of Spondylus for the 8-bit Nintendo Entertainment System. First, the angles are really bizarre. Assuming that the threatening robot dinosaur is not so far in the foreground so as not to be threatening at all as it strolls casually by, and that the robot figure is of generally human proportions, we are presented with a ballistic conundrum of JFK conspiracy proportions. How is it that the laser-firing robot manages to fire with his foreground hand into the background side of the dinosaur's neck, at a sufficient angle for the bullet to emerge into the foreground again? Power the Mighty Robot Dinosaur, Cyborasaurus on a Mission to Save the Spondylus System! So the game is not meant to be about the Destruction of Spondylus, in the end. Nor is the player a humanoid robot battling mighty robot dinosaurs. We're actually meant to identify with the giant cyberdino whose vital neck circuitry has just been disrupted by laser fire. Glad we got some of that straightened out. 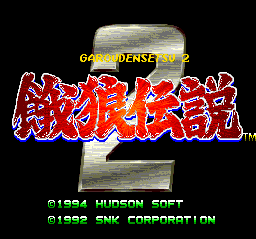 This week, it's an easy one -- Garou Densetsu 2 for the PC Engine, ported by Hudson Soft from SNK's Neo-Geo classic known in the US as Fatal Fury 2. This CD-ROM disc arrived fairly late in the PC Engine's life, and was one of the first to require the Arcade system card. 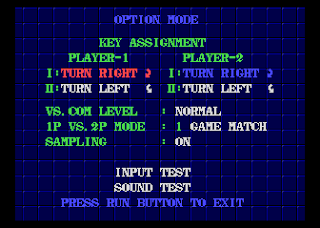 This add-on contained enough onboard memory to support plenty of sound bites and animation frames, and was used primarily to port several of SNK's Neo-Geo games to the PC Engine. 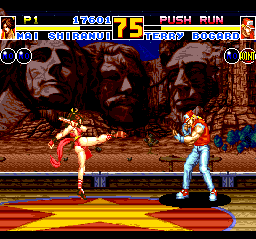 The Garou Densetsu 2 conversion was very faithful for its time, with CD-audio used to capture the arcade game's sample-heavy background music, and provided console gamers with a cost-effective alternative to the real Neo-Geo deal. There are some cosmetic differences of note between versions. 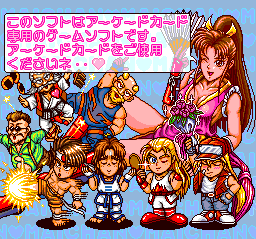 The PC Engine opening looks slightly different, with the large character sprites "shuttering in" on split scanlines instead of fading in from white, and the text that "folds" in and out on the Neo-Geo just appears and disappears on the PC Engine. 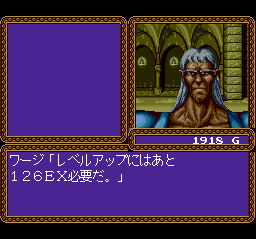 The parallax depth of the scrolling backgrounds is also lost, and the color-cycling is rougher. The sprites have lost some color depth and the animation isn't as smooth as the rock-solid 60 fps of the original. 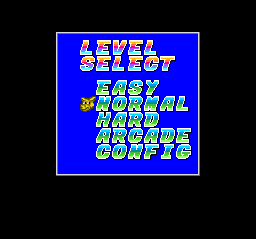 And the incidental music for the level select and victory screens is rendered via chip, rather than CD, and sounds pretty poor in comparison. 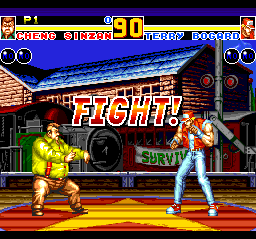 Except as a collectible, there's no driving reason to own this game for the PC Engine in the 21st century -- perfect emulations of the Fatal Fury series have been made commercially available on the Xbox 360, Playstation 2 and Wii by SNK Playmore in recent years. But back in the day when the Neo-Geo was out of reach for all but the most dedicated and affluent gamer, Hudson Soft delivered the goods. 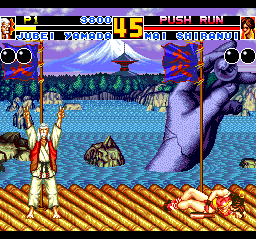 Garou Densetsu 2 is not perfect, but it's one of the best fighting games ever released on the PC Engine. If you're in the market for this title, you may be able to find it at this affiliate link -- or if you have the hardware, you could pick up the actual, non-region-locked Neo-Geo cartridge here. European cartoonist Peyo created the little blue Smurfs (originally known in French as Les Schtroumpfs) before my time, way back in 1958. 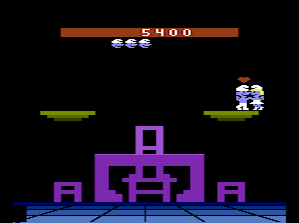 Their North American popularity peaked during the early 1980's, with collectible PVC figures, an animated Saturday morning cartoon series, and a 1982 videogame cartridge, courtesy of Coleco. 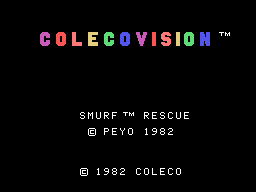 Smurf Rescue in Gargamel's Castle (there apparently wasn't enough cartridge memory to store the entire title, let alone a title graphic) was one of Coleco's few non-arcade-based licensed games. It was announced for all three platforms Coleco supported at the time -- the Atari 2600, Mattel Intellivision and Colecovision -- but only the Atari and Colecovision versions actually saw release. The game is historically interesting as one of the earliest true platform games -- while the screen did not scroll (except as a between-screens transition on the Colecovision), the jumping and ducking gameplay is a recognizable forerunner of Super Mario Bros. In both games, after Smurfette is rescued the action starts over at the beginning, with a longer/more difficult road to travel; again, this suggests her return to Gargamel's castle is entirely voluntary. The easiest skill level allows young players to see the whole story without too much trouble, as the game doesn't take more than a few minutes to play from beginning to end. 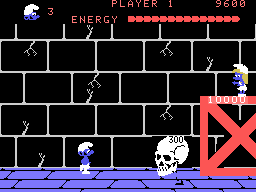 The Smurfs would appear in several other videogames over the years, but this early title is still their most memorable and historically important. Simple but playable cartoon adventures have been with us ever since.